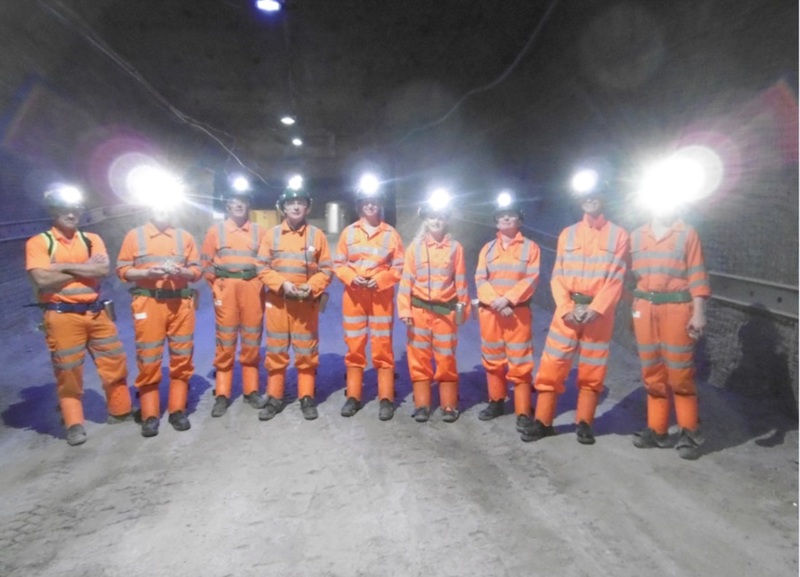 Clive Mitchell from the BGS recently visited Boulby Potash Mine in North Yorkshire with colleagues from the BGS, NERC, Heriot Watt University and Newcastle University to learn all about the subterranean science being carried out in the Boulby Underground Laboratory (BUL). We made an early pre-breakfast start from the hotel in Whitby as we had to be at the mine for 7.15am in order to get through two inductions and a hasty breakfast. Our guide and chaperone was Professor Sean Paling, the Director of the lab, who cheerfully lead us through the day. We quickly suited up in bright orange overalls plus steel toe capped boots and shin guards, hard hats with ear defenders and miners lamp, a chunky belt and the all-important self-rescuer (a shiny metal box that container a breather to scrub carbon monoxide out of the air in an emergency). We were each presented with two tally tokens, V6 in my case, which had to be surrendered to enter and leave the mine. Don’t lose them we were told! We descended with the mining shift around 8.30am – I was not entirely sure of the time as I had to leave my electronic and battery operated devices on the surface. This is because of the risk of explosive gas in the mine. The descent took the count of 300 elephants in my head (roughly 5 minutes). Boulby Potash Mine is the deepest mine in the UK (down to 1300m) and has operated since the 1970s. Potash (a mix of potassium bearing salts, the most valued being sylvine, potassium chloride, KCl) is used in fertilizers, chemicals and pharmaceuticals. Roadways have been tunnelled into the underlying halite (sodium chloride, NaCl) as it is more competent. The extracted halite forms one of the products of the mine and is mostly used for road de-icing. More recently the mine has started to produce polyhalite (hydrated potassium, magnesium, calcium sulphate) which is a completely new product used in fertilisers. The 15 minute walk along the salt roadways to the lab was a slightly surreal experience. It is very dry and hot (temperatures get up to 35oC and higher in the mine). The 8m wide tunnels are maintained with rock bolts, mesh and metal bands. In places, large hexagonal patterns can be made out in the ceiling; these are the infilled evidence of evaporation cracks that formed at the surface of salt pans and are close to the upper surface of the halite beneath the potash. 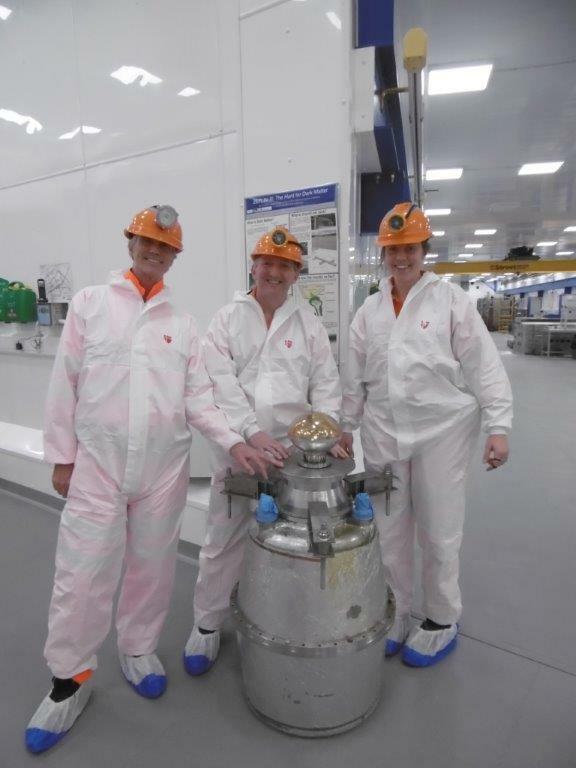 On reaching the lab we suited up in paper overalls, hard hats and shoe covers as it operates as a clean room. Boulby Underground Laboratory is an impressive facility that is operated by the Science and Technology Facilities Council (STFC). It did feel a little like Moon Base Alpha in reverse. As a science facility it exists because it is buried deep below the ground in a salt deposit. This acts to shield the lab from the majority of cosmic radiation that occurs at the earth’s surface. As a consequence it is a comparatively ‘quiet’ environment to conduct fundamental research into dark matter which is thought to form the missing 85% of the mass of the known universe but remains unseen. In addition, the lab has expanded its research activities to encompass muon tomography to image the uptake of CO2 by carbon capture and storage, astrobiological research into life found in extreme environments such as the salt brines in the mine and it acts as a testbed for tools to be used by the ExoMars rover that is planned for the 2020 mission to Mars. An excellent article on the lab and its science was published in Geology Today (Vol. 33, No. 4, 2017). main output of Boulby Mine. Halite (rock salt, sodium chloride) from roadway at 1100m depth in Boulby Potash Mine. Our 4 hour mission to the mine went very quickly and we were whisked back to the mine shaft to leave with the 1.10pm shift change. It was another 300 elephants back to the surface world. Some of us emerged back above ground clutching samples of halite, tangible evidence of our slightly out of this world experience in the subsurface.